The need to create runs deep for many of us. Know the feeling? It's the drive that feeds our very souls. Simply put, creating makes us feel good. Yet there is rarely time to indulge when family and work take priority. And when we do, there is always that nagging guilty feeling. So how to balance it all? Robin Fator, owner of the handmade classic glamour fashion Etsy store, Dark Pony Designs (based in California) struggled with that same question for years. Her quest to find balance between her creative and family lives eventually led her to share her experience and findings in her book, Get It Together: Etsy Success, Creativity, And a Guilt-Free Family Life book. I received a copy for review. It's available in Kindle and in paperback form from Amazon or as a PDF from her own site. The beginning of the 77 page book is devoted to her own story. It made for an absorbing read. Robin, who had her children young, tells of the years when she slowly began to realize she needed something else in her life to make her whole. It was rather like a voyage of self discovery. She puts it differently but essentially happy parents have a profoundly positive effect on their families. It seems obvious but some parents view their role as one of self sacrifice. And when their kids grow up and leave, what then? Part of the book includes helpful tips and some probing questions to overcome conflicted feelings, self doubt and to raise self-respect. Organizing your life is also key to fitting in time. She shares her current daily schedule where she carves out blocks of time for herself. Her prioritizing tip of "taking cleaning off the top of your to do list" followed swiftly by making sure everyone in the family contributes to the upkeep of the house, struck a chord. The author also helps the reader decide on the choice of creative area. It took Robin herself some time to figure out what she loved most (fashion) but others may already be there with an existing hobby. She did have a short section on how to come up with some seed money to start a home business - useful for those with limited funds. But she only touched on researching what other designers do whereas it might be more advantageous to consider what others are not doing. Filling a unique niche - an unmet need - cuts the competition from the get go. Robin is right - you do need to know what you like and why. You also have to enjoy what you do. The section which resonated most with me was the one on failure. People are so afraid of failure. Yet failure, learning from mistakes and being open to constructive criticism do lead to better things. Robin shared a couple of her failures. One was her Greek Goddess Feathered Headband! It got picked up by Regretsy and led to over 50 sales! The trolls were unkind. But she did not take it personally and said, " I chalked it up to - "there's no such thing as bad press!"" A large part of the book was all about how to get an Etsy store up and running. While the information is available elsewhere online and sometimes in greater depth, her succinct collection of topics and numerous web links makes her book a handy guide for those just starting out. It is because of those links that the book is better read as an ebook as it required tedious typing to access the web from a physical book. The overall tone of the book was one of "just do it". So often people talk themselves out of doing. The author lays out what needs to be done without being too bogged down with details. The topics are universal like shipping, payments, shop policies, customer service, social media promotion, etc. There was one exception - taxes- which was specific to US store owners. SEO (search engine optimization) is important for buyers finding items, so her section on listing and using the right keywords explains the basics in a simple fashion. Perhaps a little more about branding could have been covered but Robin does touch on using consistent names for social media platforms. If you're overwhelmed and unable to "get it together" then this easy to read book might well get you started on the road to a more fulfilling life. 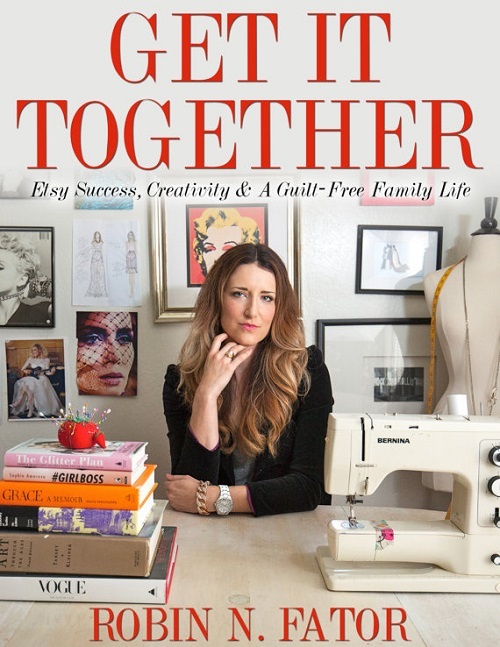 If you'd like to win a copy of Get It Together: Etsy Success, Creativity, And a Guilt-Free Family Life , please make a comment below. Make sure you leave contact info below if you do not have an online shop or blog. This giveaway is international. eBook only for outside the USA. It ends in a week's time at 6 pm EST Monday, March 3, 2016 . I will pick the winner randomly and announce the results as soon as possible after. So be sure to leave a contact email if you don't have an online link or make sure you come back and check! Otherwise I will redraw in a week. Good luck! I receive books and products for review. The Amazon link above is an affiliate link where I receive a small compensation for anything bought through this blog. My opinions are the same whether or not I receive any compensation. It sounds like a really interesing book. I would love a chance to win it. Sounds like a great book worth reading! I'm always looking for fresh perspectives on selling on Etsy & similar sites, as well as how to maintain balance in my life. Your review of Robin's book is very intriguing. Pearl, as always, I want to thank you for all the effort you put into the Beading Gem; it really helps the beading community. I always look forward to your blog & Facebook posts. Thanks so much for your kind words, Holly. Readers like you are the reason why I keep writing this blog. Would love to win this! Thank you for the opportunity! This book sounds like it might just be the impetus I need! Pearl, what a great book! Would love to have the organizational help. I am a blog subscriber! Hi Pearl, please enter me in the drawing, thanks! Boy, do I need to read this book! Would love to win this! You mention Kindle etc. and I'm wondering if that includes a Kobo or any type of ebook reader. Sounds like Robin is a highly motivated person to begin with. She has a family, an Etsy shop, AND can write a book. Wow! I'm totally impressed!!! Chuck my name in there Pearl. Even if I don't ever open an Etsy shop I do love to read other people's stories and take what I can from them. She sells the PDF version on her site. You can read this easily with any eReader or on your computer if you do not have a Kindle. Pearl thank you for another great giveaway. Would love to read this. Wow this sounds like exactly what I need! N like its full of the perfect advice, would really love to win it and use some of the tips to regain some life back. Blog follower and subscriber, can be reached at retro-grrl@hotmail.com. I would love to win a copy. I have been struggling with these issues for years. Wanted to a bunch of work stuff done this morning but ended up in a think with my family about stuff in the fridge and ended up cleaning the refrigerator. I would love to read and learn from her story. thank you for the opportunity! Sounds like a marvelous resource for my daughter and myself, we're just getting started w/ Etsy & Handmade. I'd be so happy to win this book as a jump-start to our business. I would love to learn if selling online is worth my while. Thank you for the give away. This sounds like an awesome resourceful book. Thank you for the chance to win a book that looks full of great information. Thank you for another wonderful opportunity and someone else's perspective. Hi, I need to Get It Together! I would love a copy of this book. Great critique! I think this would be a great book to read - I'd love to win it! Sounds like a very interesting and easy read; as well as packed with info. Thanks for sharing this book. I am still trying to get it together but there is always something I can find to stall my start. I would love to read a copy of this book. Thanks for the chance to win. I would love to win this. My fingers are crossed! This looks like the perfect book for me to read and get back into the swing of making jewelry. With all that has happened in the last couple months my world seems hopeless - but this seems to be something I can use in my life. I have toddler twins and an e now so busy looking after then that it leaves basically no time for any creative pursuits, so I'd love to read the tips on how to find a better balance! Wow, Pearl, this looks like it is a fantastic book. Thank you so much for having this giveaway for it. Even if I don't win, I am still putting it in my list of must have books. Did anyone notice that March 3rd is Thursday. Hehehehe. March 3 is the correct end date. The giveaway started last Thursday. They are always one week in duration. I could surely use this! As always, thanks for the giveaway, Pearl.